Last week, my friend and I where trecking from Orzola (in the North) to the "new" lavastream near Tinajo. Great landscape, friendly people (very few! ), a lot of space. No rivers or fountains - but every day, we found a shop, petrol station or bar where we could buy water. The agriculture is special because of this lack of water: Walls and terrasses help to keep the soil on place. Farmers cover the fields and gardens with small lavastones, so in the night, when the air from the sea is damp, they absorb the humidity like a sponge. Most houses can collect rainwater from the roof or court in a cistern. And many fields are in the middle a village. Probably for shorter waterways? Busstation in Arrecive. Complicated for newbies, but you can go almost everywhere. Arrieta, Water in an 8L-bottle. What we 2 hikers needed in 24 hours. 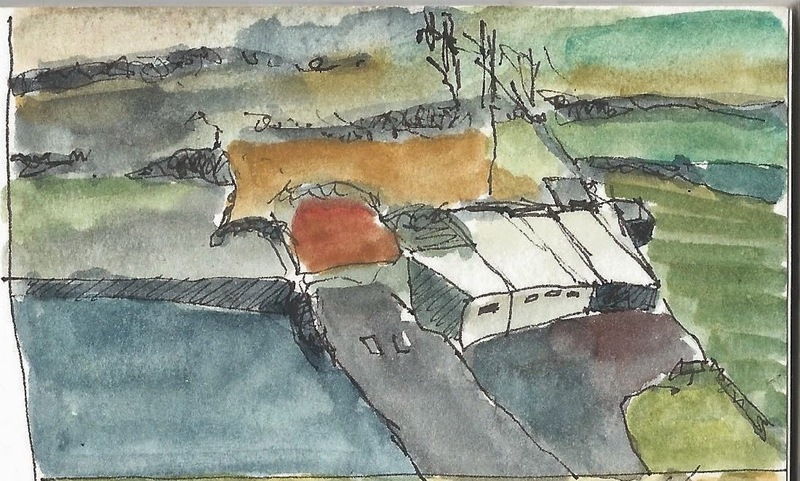 Little farms near Haira. The black fields are those with lavastones. A small waterhouse in the desert. Just in case it would rain one day... The cistern was empty. But in gardens and agriculture, the plants were bright green, nearly shining on the black soil. The whole way was full of beauty. And the onions we bought were as big as oranges. 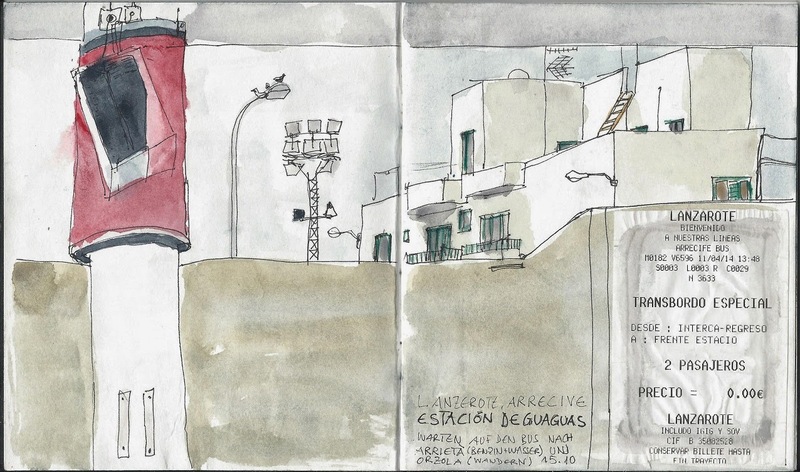 Thanks for inviting me to Lanzarote by your spontaneous sketches that render the landscape of the island splendidly. Mit Deinen Aquarellen lässt Du uns an Deinen Ferienerlebnissen teilhaben. Farbe und Atmosphere sind wunderbar erfasst. Schön wie die weissen Fassaden vor dem grauen Himmel leuchten. Ganz toll auch die Haciendas aus der Vogelperspektive und die Isola la Graciosa! Merci Eva und Olivia für die ermutigenden Kommentare! Zwischendurch hatte ich Zweifel, weil die Guache doch etwas schwer wirkt. ... aber auf blogspot sind alle meine Skizzen dunkler als sonst (original und flickr). Geht euch das auch so? Macht ihr sie heller vor dem Posten? 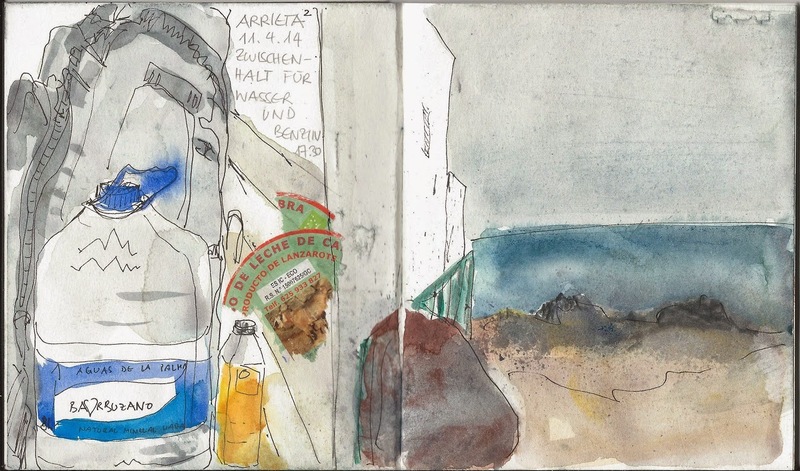 Nice text and sketches, thank you for sharing your trip! I like the unusual views from above.